Process Serving Technology: Your Clients Can Now Pay By Credit Card via Client Interface! 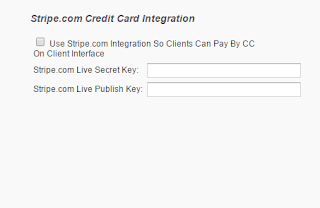 Your Clients Can Now Pay By Credit Card via Client Interface! Real-Time Credit Card Processing Is Here! Help us test it out and make sure it's hot! Sign up at http://stripe.com and activate your account. Go to https://dashboard.stripe.com/account/apikeys and take note of your API keys. Check the box to Use Stripe Integration and copy and paste in your keys and Save. Then, then your clients log in as Law Firm and go to My Account, they can select Open Invoices and pay them! We will be adding options for Pay Now buttons in invoices as well as client registration and prepaying new jobs submitted online with credit cards.